The year is coming to an end. Have you accomplished your new years resolutions and goals? At the beginning of 2010 I made several resolutions and decided upon a number of goals. My resolutions might sound a bit strange, but I wanted something that would be attainable and fun at the same time. During my first BodyPump class of the year, I shared my goals with my class. There were mixed reactions. I think it’s because none of my goals and resolutions were fitness or health oriented. Maybe next year, I’ll have to think on that and get back to you on Friday! Here were my resolutions for 2010. 1. Wear more Hats. Now, I was not trying to be metaphorical, suggesting that I wanted to become more of a renaissance woman. I meant that I literally wanted to wear MORE HATS. Berets and cowboy hats, beanies and chapeaus. I look good in hats. Sadly, I did a poor job of accomplishing this goal. Send me pictures of cute hats, I need to try again this year. 2. Eat more Chinese food. Why? Because it is delicious. I’m not sure if I can check this one off the list. I think that if I had made it a more generic goal, like “Eat more Asian cuisine,” then I could put a check mark there. I ate an exceptional amount of Thai food this year. I’m going to include all the Indian food I ate as well, since India is on the continent of Asia. Asian Cuisine accomplished. 3. Complete current work project. Easy enough to understand - finish my total synthesis. A work goal. Sometimes being a synthetic chemist is a little disappointing because it can take an entire year (or five) to complete a single project. Thankfully it is done and I’ve moved on to another project, which will hopefully be done soon! 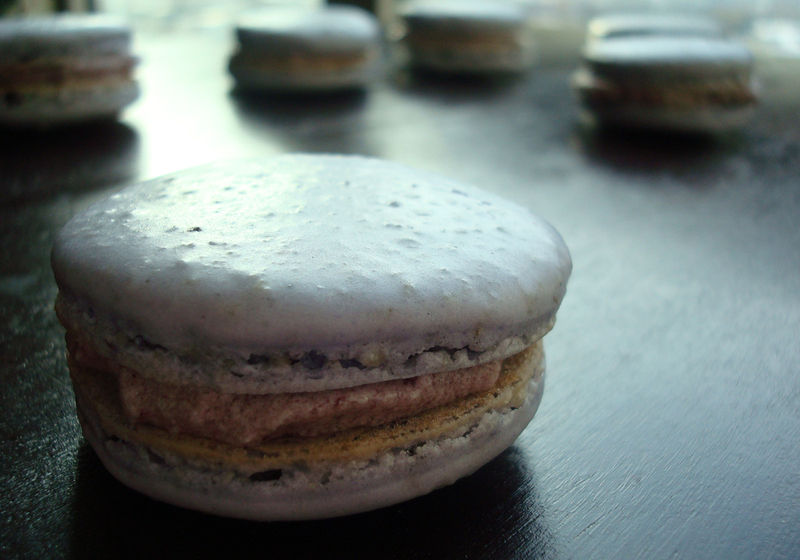 Making French macarons was not on my original resolution/goal list. They weren’t even on my radar in the beginning of the year. This year I have transformed into more of a foodie, with the start of Wilde in the Kitchen and my many worldly travels, I have learned so much more about cooking, baking and eating! Here’s to 2010! I hope that whatever the year brought you, you’ve learned, loved and had some great moments along the way. After taking on my first set of macarons, I felt like I was capable. 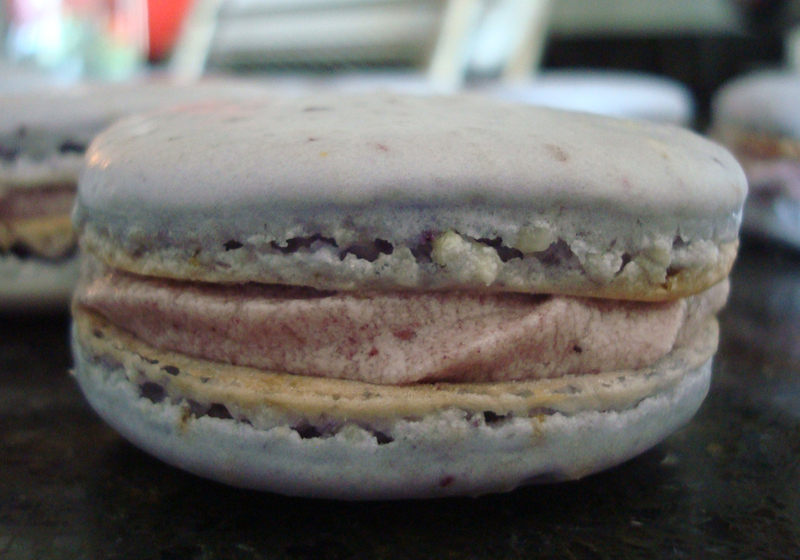 I had accomplished the French macaron, with feet and all! I had read that using flavored teas was an excellent way to infuse the macarons with flavor. I was a little suspicious, but once I added the tea to the batter, the room smelled like blueberries! 1. Whip egg whites until they are foamy, at least doubled in size. Gradually add sugar and whip until the egg whites are glossy and shiny. 4. Equip a piping bag with a 1 cm tip (something smaller than a half-inch). 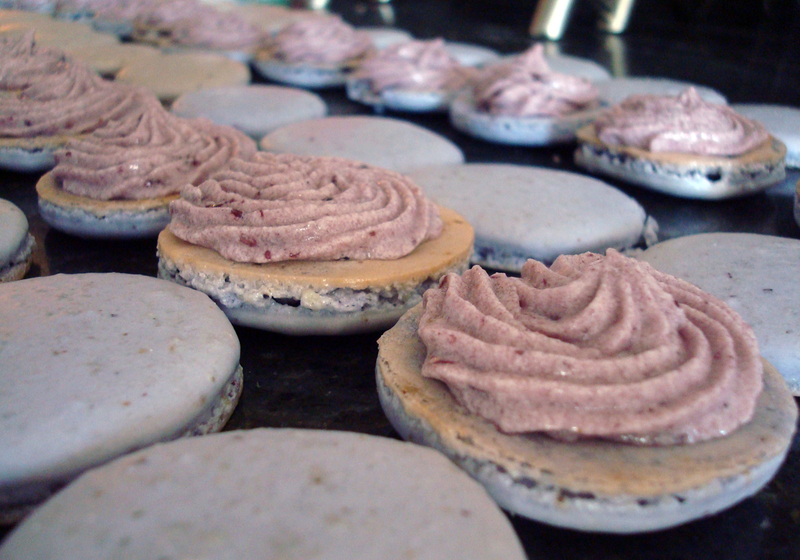 Prop it up in a tall glass and add macaron batter to the piping bag. 6. Pipe 2-inch circles on the baking sheets, leaving about ½-inch spaces between the cookies. They shouldn’t spread, so they can be pretty close to each other. Allow to sit for at least 30 minutes. This will help develop a shell on the outside and helps create the foot when baking. 7. Cook macarons from 10-12 minutes or until they don’t wobble on their feet when touched. 8. Remove from the oven and remove from the baking sheet (just pick up the parchment or silpat) and place on a wire rack to cool completely. 9. Flip over half of the cookies and spread with buttercream or jam, top with a shell of roughly equal size. 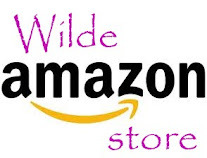 Store in the fridge, but don’t eat for at least a day. This will let the macarons meld together and get all delicious! 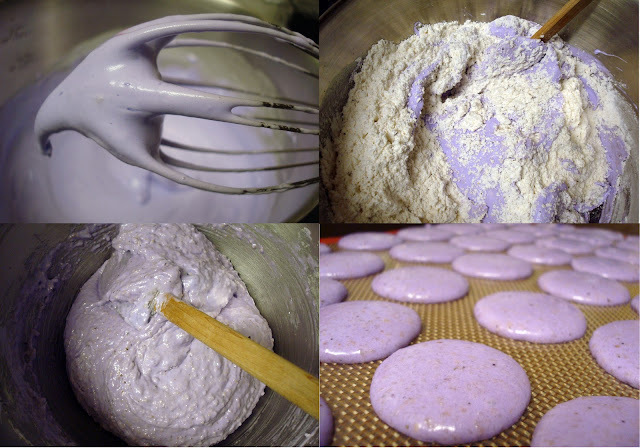 This is an Italian meringue method for making the buttercream, adapted from a Martha Stewart recipe. 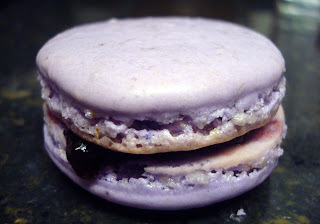 The blueberry flavor comes from the addition of blueberry jam. I used a product from Smuckers called “Simply fruit.” It’s mostly berries with few other ingredients. In a small saucepan bring sugar and water to a boil and bring to 238 degrees. Place egg whites in a medium bowl and whisk until foamy. Add cream of tartar and whisk until stiff peaks are formed. Slowly add in sugar syrup, continuing to beat on high. Beat until no longer steaming hot, about 3 minutes. Add butter, one tablespoon at a time, beating until smooth. Add vanilla and blueberry jam, combine.